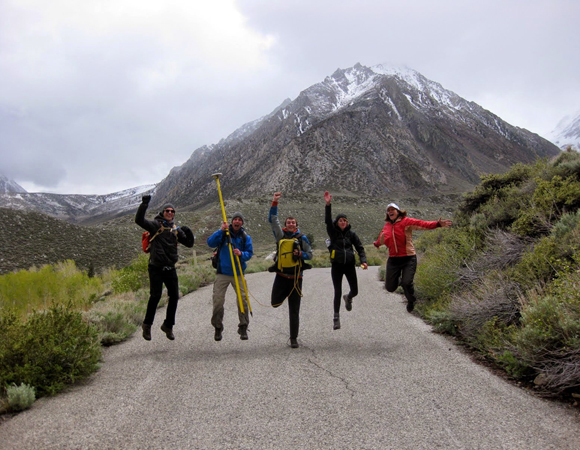 Despite day after day of rain in California's drought, 15 students of various majors are traipsing around the desert in Indiana University's Volcanoes of the Eastern Sierra intro-level field course. The course is led by UNAVCO community member Michael Hamburger and is still going strong after 13 years. UNAVCO supports the class with staff and equipment. This year, UNAVCO outreach specialist Beth Bartel, a former field engineer, joined the course. 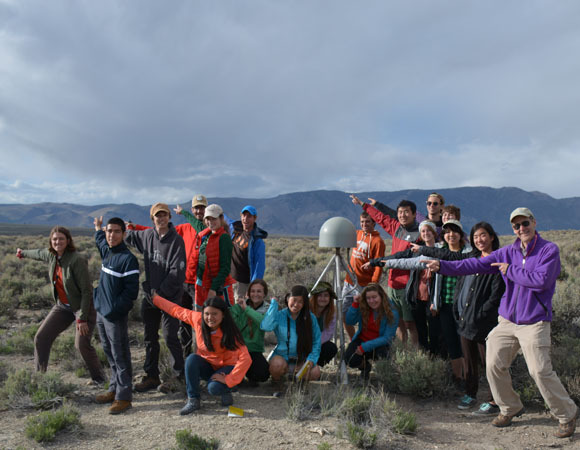 She gave a chalk-talk on how high-precision GPS works, led the class in a day-long real-time kinematic (RTK) GPS exercise, shared a sampling of the many scientific applications of GPS, and co-led an evening discussion on precision. 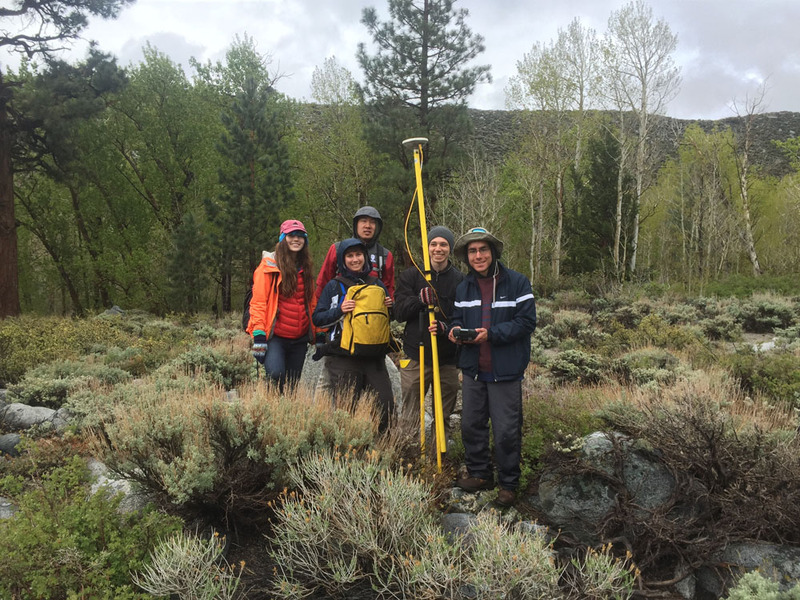 On survey day of the course, students used both GPS and leveling to measure a survey line across the Hilton Creek fault at McGee Creek, and also hiked up to get a view of the fault from atop a massive moraine. 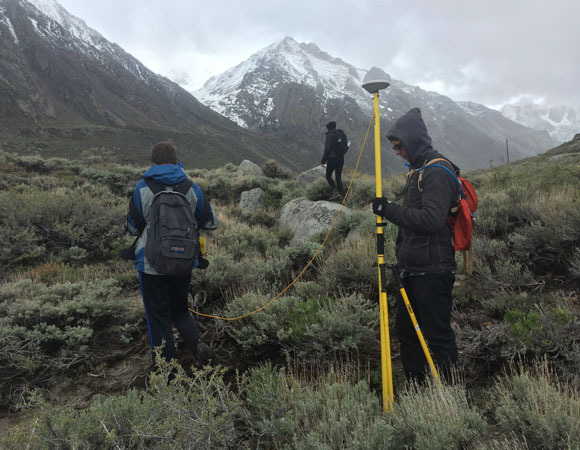 That evening, instructors and students compared the survey methods with the students estimating the true precision of each, and how to improve it. 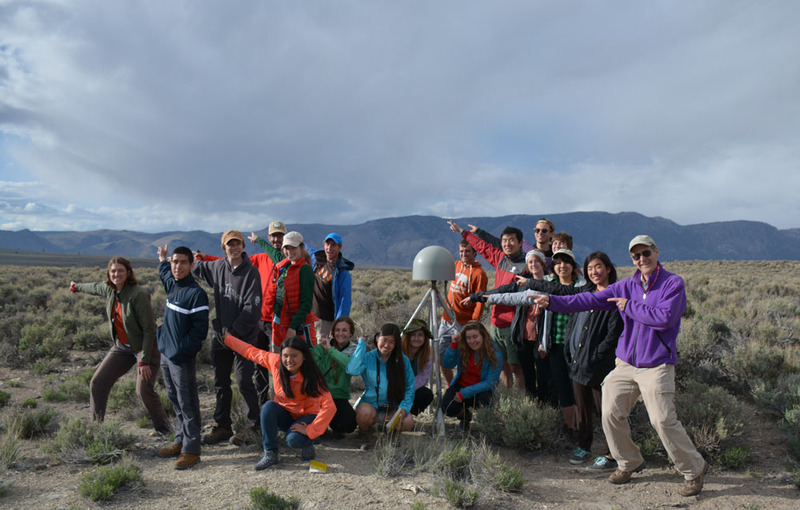 The class also had the opportunity to stop by EarthScope Plate Boundary Observatory GPS station P646, in the Long Valley Caldera. Geodesy day in the Volcanoes of the Eastern Sierra course comes about halfway through the course and is a break in observational geology to pick up some instrumentation and make measurements. This component gives students a hands-on opportunity to learn new technology and think about the use of instrumentation in hazards science. Majors in this year's class include geology, biology, English, math, policy studies, history, informatics, and environmental management. 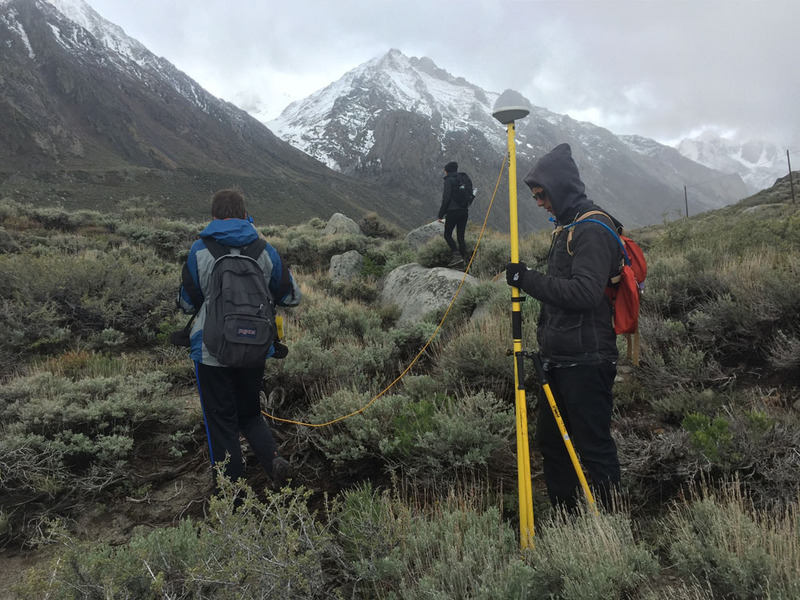 This class exposes students of a variety of majors, who will make careers in many different sectors of the economy, to the importance and applications of Earth science. Rain can drench clothing but apparently not dampen the spirits of this group. 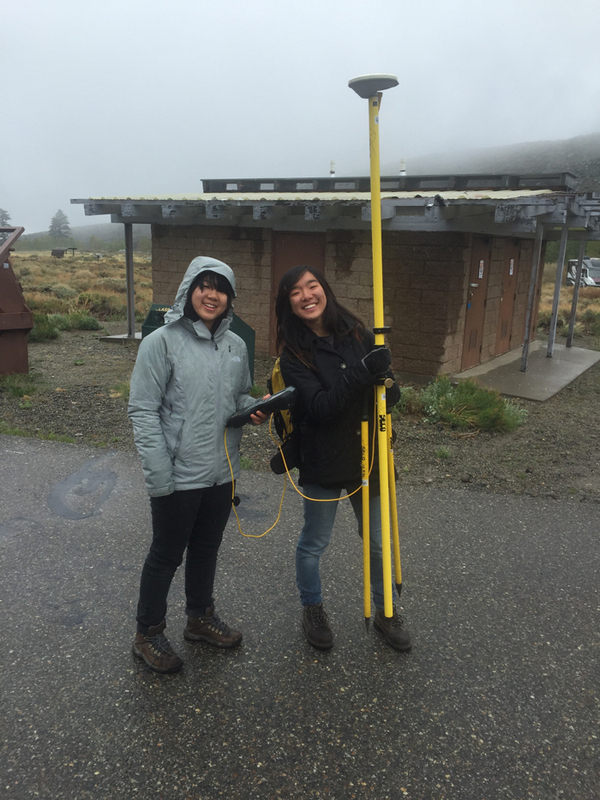 On geodesy day, we had a drizzle, but fortunately not a downpour. The rain did have us off to a slow start, but thanks to everything else going smoothly and an eager crew, we had the entire 28-marker line surveyed by lunch. It helped that lunch didn't happen until around 2pm. Keeping students engaged when already tired and overwhelmed is a constant challenge. We break students up into small groups so they are never just standing around and listening once we are in the field. Small group sizes allow students to be constantly involved. 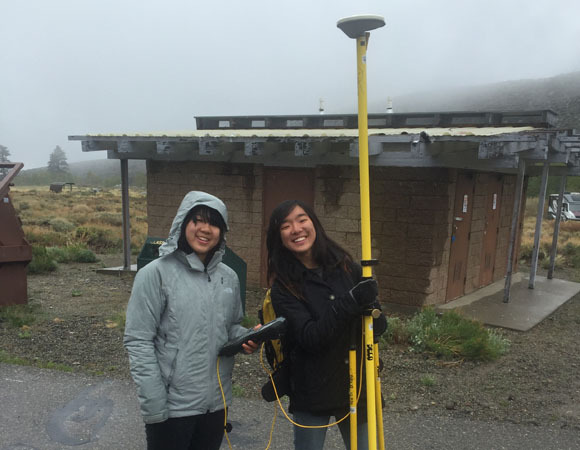 The first group helps set up the base station and start the survey, ultimately learning the most about GPS. Once we start the rover, we divide up the roles so that one person carries the receiver, one carries the antenna on the range pole, and one carries the survey controller. 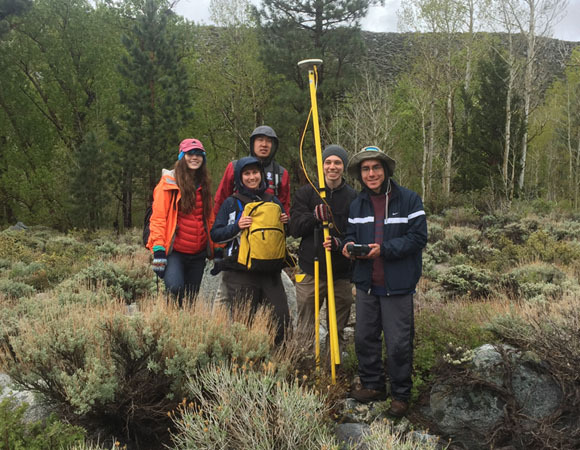 The GPS surveying becomes an exercise in communication and teamwork as well as surveying. They rotate roles within the group, teaching each other how to use the controller to navigate to and measure the markers. Along the way, we discuss precision and reinforce what the students learned in the lecture about how GPS works.